It covers 71 per cent of the Earths surface. It makes up 73 per cent of the adult human brain. Without it, you would die within a number of weeks. And if you are deprived of just a small percentage of it, your body and brain begin to suffer. What is it? Water. If you lose just one single per cent or your body’s weight in water, your body and brain will start to slow down and your performance on physical and mental tasks will suffer. At a two per cent loss of your body mass’ water and above, your ability to think clearly, focus, make decisions and carry out a whole range of important cognitive tasks becomes significantly impaired, researchers at the Georgia Institute of Technology have found. There is already much research out there that shows that a two per cent water loss affects physical performance, including endurance and co-ordination. But when Georgia Tech reviewed 33 studies on what dehydration, can do to your brain, they found some disturbing results. The studies, which covered volunteers with between a one and six per cent water deficit, revealed that participants increasingly made mistakes the more water they lost, particularly on tasks related to concentration. Being dehydrated can impact your work, your relationships and your ability to make wise and reasoned decisions, as well as your physical health and mood. “If you drop four or five per cent, you’re going to feel really crummy,” the professor said. Professor Millard-Stafford also pointed to the dangers of being dehydrated and not being alert when you really need to be. Driving a car in the summer heat or working in a hot environment with potentially dangerous machinery, such as a factory or in a military role could prove fatal. Acute dehydration is not actually that uncommon. The researchers noted that doing two hours of yard work (or gardening if you’re from the UK) in the summer sun without drinking water is enough to impact your concentration. 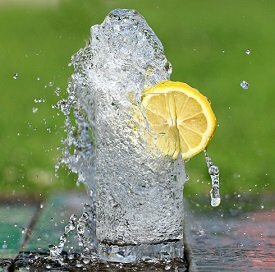 Anyone can become dehydrated fairly quickly if they are not drinking enough water, especially during hot or humid weather, when drinking alcohol, or while exercising. Just an hour of moderate exercise in hot weather can cause you to sweat out two per cent of your water. An adult generally needs between 1.5 and 2 litres of water per day to function well, and more if they are sweating or urinating a lot. It is best to sip water throughout the day. If you are thirsty, it is a sign that you are already dehydrated. Symptoms of mild to moderate dehydration include headaches, dizziness, and darker-coloured urine, as well as loss of focus. If you are losing water, adding a bit of salt to your food can help you to retain more water. If you don’t like plain water, you can add cordial to it or drink herbal teas. Eating watery foods like cucumber will also help you increase your water intake. “Water is the most important nutrient,” Professor Millard-Stafford concluded. I have to agree. Without adequate water, no other brain health strategies or supplements will be effective. However, if you are keeping your water intake up, feel free to check out my book for even more ways to boost your brain. The Georgia Tech study was published in the Journal Medicine & Science in Sports & Exercise.